It is unfortunate that across forty-four winters in Ontario I never knew about ice wreaths - all that cold weather wasted! When I learned about them I couldn't wait for the next cold snap here on Vancouver Island (actually I could wait - happily forever) but I had to experience them and during the next period of below zero temperature I did. I put water and snowberries and holly berries and variegated leaves in a donut pan and froze it. Strung the small wreaths on some clear fishing line so they would appear to float. Hung them outdoors on a branch. It was foggy. I stood and stared. They were enchanting. They were melting as I finished taking their pictures. Out of the blue came the thought "I wonder what it would be like to knit soup." Having a cold may have had something to do with it. The bowl part was not difficult except to come up with a cord that would represent porcelain and be solid enough; I found some white gimp in my stash and crocheted a bowl shape. Here is what the bowl looks like. The challenge was to create something from fibre that would suggest soup - or stew. A thin cotton (I assume that is what it is; found it in my stash on a cone with no identification) got knit into a square and put in bottom of bowl; the same cotton was then randomly crocheted into a looser mass and I plan to do more of this. It is a work in progress. Peas and carrots are in soups; so far - one pea and one carrot slice. I had thought to do them in extreme embroidery on the knit cotton square and may still attempt this; I also like the idea of vegetables in the midst of the bubbling fibre. The spoon: it sort of happened. I've not done much work with wire but could not think of what else to make a spoon from still using fibre and I had some silver wire..... The 20 gauge was too stiff and I made 'something' with it - just not sure yet what that 'something' is. Using 24 gauge and a metal crochet hook and thinking about a spoon - my hands took over and after awhile I had this - spoon. It was a strangely satisfying process as it usually is when something 'sort of happens'. Satisfying the requirements of being as simple a design as possible, clothing as architecture housing the body, fibre archeology/recycling - this hat is made from a slightly felted, handknit sweater, unearthed at a thrift shop. A 15- inch circle was cut from the front and the back, the two circles put right sides together and stitched half way around the circumference. Edges left free. Tortoise knitting needles are used to change the shape. Here it is with the original sweater. The rest of the sweater will be turned into mitts and a mini shrug - or -? I very much like how thoughts of whoever knit the sweater come to mind as I reconstruct and hope that he or she would like this 'rescue'. I assume that whoever donated the sweater had accidentally put it into hot water or a dryer and the felting was not welcomed; it likely no longer fit as it once had. Both sides up and 'pinned' with the knitting needles. ... the flap forms a visor in this sou'wester version. 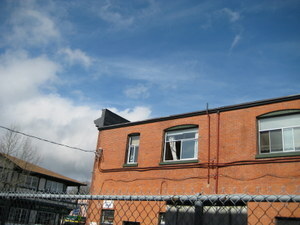 Back view of the sou'wester. 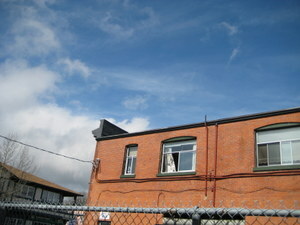 Side view of the sou'wester. The hat works well in both sunny and rainy weather on its own. I imagine that teamed with a scarf it will tame cold and wind .... or desert weather. The first time I heard a group of knitters talking about steeking I just didn't get it. "Why knit something and then cut into it;", I asked, "why not just knit two pieces?" Well, knitters tend to be patient at explaining and I was patiently explained to. I have to admit I pretended I understood but really, I didn't, because I hadn't then - still haven't - knit something that was knit that way so that it could be, should be steeked. I'll likely 'get it' someday and then wish someone had told me much sooner but for the moment if I knit something that wants to be in two pieces I knit it in two pieces. However, the notion of steeking stuck in my mind and when I came across a lovely, soft, warm, oscar green men's machine knit pullover sweater with that common three button neckline I admired it and was putting it back on the rack because I don't tend to wear pullovers. Then - "Steek it!" - shouted from my subconscious. It helped enormously that it was in a thrift store so the monetary investment was not that great and would allow the sweater to be stuffed into a garbage bag and disposed of should the cutting experiment result in an explosion of wooly ends. Actually it was on a breath-out that I cut: doing something while holding breath is generally unhealthy and less than productive. I had folded the sweater along the center front and it was along this line that the scissors suddenly created a left and right front. I think I had my eyes open the whole time of cutting but I know I did feel them widen when the seam did not immediately unravel. In fact, when I tried on the newly-created cardigan sweater and was admiring myself/itself in the mirror, I realized the edges had nicely folded in on themselves like stockingette knitting tends to do and did not need finishing. I then, in madcap manner (as confidence will bring on) cut off the ribbed bottom which released the body of the sweater to drape nicely. The bottom end did not curl under but all the little stitches made a picot edge and after months of wearing not one of them has broken rank. The three buttons at the top and then the loose flow of the rest makes for a pleasant design. I've steeked several sweaters from pullover to cardigan since then. Two I have finished the edges by folding in slightly and stitching with a sort of running stitch. Two 'finished' themelves. Next time I hear someone discussing steeking I plan to mosey on over and put in my two cents worth. The trees are beautiful in the spring with their candelabra and across the summer with their canopy of leaves. And now - the chestnuts! Such amazing receptacles with the serious-looking spikes. And the sneak preview. And the multiple contents. No two, like snowflakes, are the same. One year I did a painting of them. One year I represented some in needle felting. There was satisfaction in the process of attempting the expression of essence by this mere mortal but this year she decided nothing compares with the real thing so they are nestled into a crocheted basket for frequent admiration by sight and by touch. Then whimsy nudged awareness on the village walk on a street lined by chestnut trees and they became ..... earrings. Asymmetry intrigues and pleases me; I use it often. With the intent of this pinafore being wearable art and wanting the ties to flow and expand, playing around with the design eventually led to the pinny draping over only one shoulder; there was also the element of freeing the ties from the tradition of centred and knotted. I stepped on a watermelon seed and it moved! I thought it was a bug. Better do it on a rug. 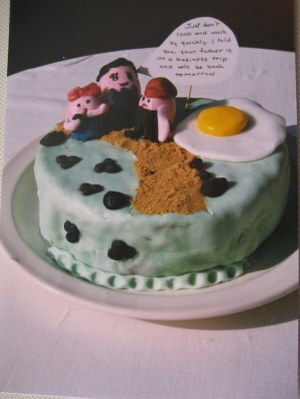 Many years ago a friend and I collaborated on a cake for our sons who were having a birthday days apart. It had ladyfingers around the sides and jello for water, life savers for buoys, little figures - oh, I don't recall all the details and it seems neither of us took a picture - but it was so much fun. The kids loved it. Years later I remembered that cake when I came across a book about decorative cakes with recipes for the different types of frostings and their specific uses - figures, draping, cut-outs. A number of cakes resulted; and I remembered to take pictures. I came across the photos while looking for something else and enjoyed the memory. That is a mother and her two kids - they are eggs (not sure why they are pink and not white!). 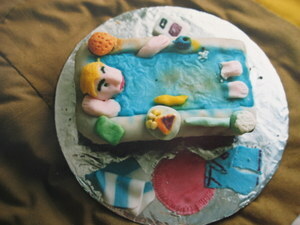 This was a cake for a friend's birthday and it was his girlfriend who asked that Jeff be in the tub, a favourite place, with all the 'necessities' nearby. 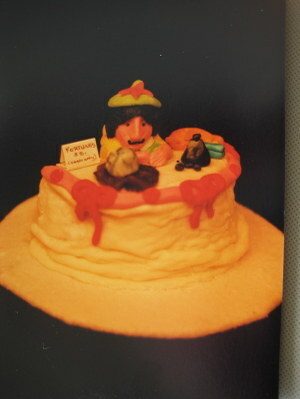 I don't now recall who this cake was for but again it was enjoyable to use icing as 'clay' (more like play dough!) and come up with the specifics of the hot tub and also to make the two men real characters. There is a cake under all of these and everything is edible. 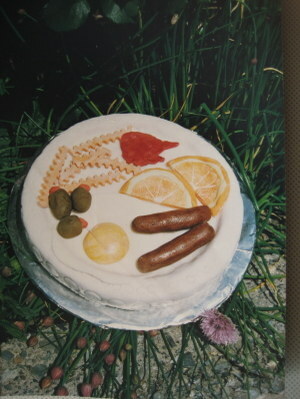 This plate of sausage and eggs etc. 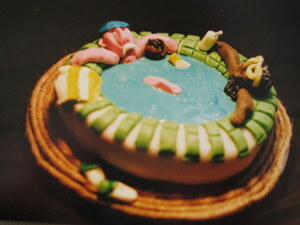 was the first fanciful cake I made. This fortune teller cake was for the son of a friend and at the party it was decided the cake was too nice to cut and eat. I am not sure when - or if! - it was eaten. Bird feeder is a success! It delights - and amuses! - me to watch birds on a badminton racquet that served quite a different purpose before now; a quirky appropriateness. During the entire time I was eating lunch in the restaurant beside this building, the curtain in the upstairs window was blowing around, billowing inside with enough drama to seriously take up a goodly space in the room, occasionally escaping outside the window and waving energetically, perhaps proclaiming freedom, albeit momentary. I was enchanted. Do other people experience that lift of the heart, that sudden transport to some other time, some other place. I wonder if I once saw a movie that featured a blowing curtain as part of the atmosphere and it stuck and is rekindled. Whatever the reason my eyes kept watching. When I had finished lunch I went and stood in the alleyway, camera poised, ready to capture the swell and swoop. The curtain and/or the wind almost left the stage. A few minor twitches and passes were all that were offered and not a single foray outside the window. This was not a minute or so attempt but even an intrepid photo-journalist begins to have second thoughts about standing in an alleyway aiming a camera where nothing non-suspicious seems to be in the range of the view-finder.